A new 2009 Honda Pilot has already gone on sale, but some 2008 models may still be available--and a better deal. The new Pilot has a more controversial style than this version. For smaller families with funkier needs, Honda's Element is substantially cheaper, but doesn't get much better fuel economy than the 2008 Honda Pilot. The 2008 Honda Pilot may not look cutting-edge, but it’s still one of the most family-friendly crossovers available. 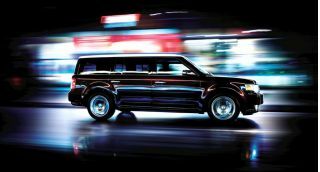 The car experts at TheCarConnection.com studied a wide range of road tests (and off-road tests) of the 2008 Honda Pilot to compile this conclusive review. TheCarConnection.com's resident off-roaders also drove the new Pilot to help you decide which reviews to trust where opinions differ, to add more impressions and details, and to provide you with the best information. The 2008 Honda Pilot is in the last year of its current body style, but it's still a good choice among large three-row crossover vehicles. In a world where so many bland SUVs look alike, the bland 2008 Honda Pilot looks an awful lot like a lot of other bland SUVs. But the inside decoration isn't quite so yawn-inducing, and the layout is practical, flexible, and logical. All the switches, dials, and indicators work with precision and a tactile satisfaction. The column-mounted shift lever can get silly at times (it's easy to pull it down too far, and in Low, it knocks some drivers' knees), but other than that, any criticism is more nitpick than harsh criticism. The Honda Pilot's standard engine is a 244-horsepower 3.5-liter V-6 engine. This is a sweet V-6 whose VTEC variable valve timing system works elegantly, and it's wed to a delectable and poised five-speed automatic. 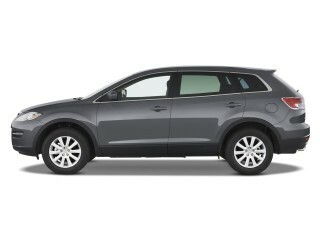 It gets 16/22 mpg with front-wheel drive, and 15/20 mpg with all-wheel drive. Since it's a front-driver in most situations, the 2008 Honda Pilot behaves like a front-driver in most situations; the nose will plow in corners and the cornering limits themselves are modest. The steering feels a bit numb, but it isn't imprecise. The available VTM-4 (Variable Torque Management-4WD) all-wheel-drive system sends power to the rear wheels automatically when needed; when conditions become seriously slippery, the driver can engage and lock 50 percent of power to the rear wheels. It's a fairly large vehicle, and inside the 2008 Honda Pilot, all the adult-sized seats are comfortable, well shaped, and accommodating. Honda thinks the third-row seat is best left to small children, and rightfully so. That third-row seat sits relatively high, though, so passengers big and small at least get good views. And as in the Honda Odyssey minivan and Acura MDX crossover, the third seat disappears into its own well to produce a flat load floor. All 2008 Honda Pilot crossovers come with rear privacy glass, alloy wheels, XM satellite radio, a six-CD changer, and body-colored side mirrors, door handles, and rear spoiler. Options include a rear-seat DVD entertainment system, a power moonroof, ambient console lighting, and a 115-volt power outlet. Three-row side curtain airbags, front-seat side-impact airbags, stability control, and traction control are standard equipment. The 2008 Honda Pilot is an IIHS Top Safety Pick, and earns five-star crash ratings for front and side impacts from the NHTSA. Though the overall design feels dated, the 2008 Honda Pilot's still a clean-looking crossover that has just enough SUV in its shape to be interesting. In a world where so many bland SUVs look alike, the bland 2008 Honda Pilot looks an awful lot like a lot of other bland SUVs. The inside decoration isn't quite so yawn-inducing, and the layout is practical, flexible, and logical. 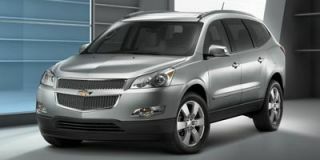 Edmunds feels “the design is getting long in the tooth and looks dated compared to newer crossovers,” though. Cars.com agrees, saying, “The Pilot's need of updating is evident in its interior. Though respectable, the materials aren't as rich as those of some fresher competitors.” Despite those concerns, all the switches, dials, and indicators work with precision and a tactile satisfaction. The column-mounted shift lever can get silly at times (it's easy to pull it down too far, and in Low, it knocks some drivers' knees), but other than that, any criticism of the Honda Pilot’s interior is more nitpick than harsh criticism. 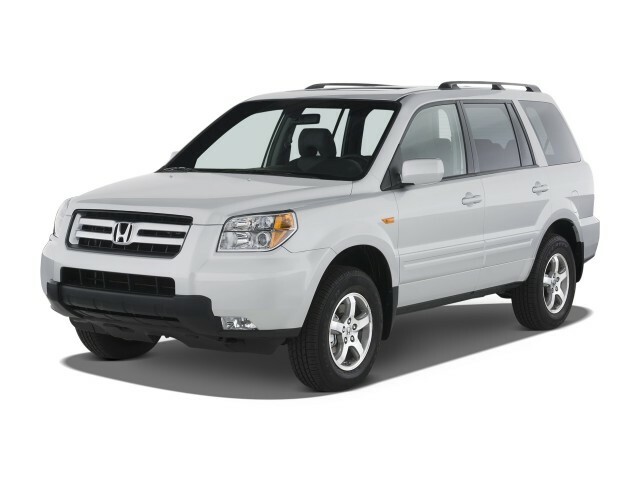 The 2008 Honda Pilot is a reasonably powerful, smooth-riding, and fairly capable family hauler. The 2008 Honda Pilot is a powerful, responsive, good-handling SUV crossover with a pleasant ride and solid fuel efficiency. In 2WD Pilots, the engine employs Variable Cylinder Management to disable three cylinders in low-load situations, such as cruising or slowing, to conserve fuel. The engine is designed to run on cheaper, regular-grade gasoline. The EPA says the Pilot gets 16/22 mpg with front-wheel drive, and 15/20 mpg with all-wheel drive. In the four-wheel-drive models of the 2008 Pilot, Honda uses what it calls Variable Torque Management (VTM-4) to send power to the rear wheels as needed. Though it does not have a two-speed transfer case, it does feature a locking mechanism to keep all four wheels powered, useful when in deep snow or on a boat ramp. 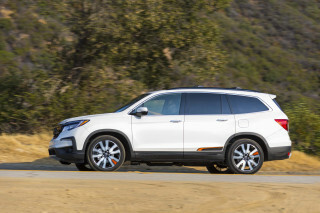 Although the Honda Pilot is a unibody crossover (unlike a truck-based SUV), it is rated to tow up to a 4,500-pound boat trailer, “about 1,000 pounds greater than many crossover rivals, but well below the ratings for traditional truck-based SUVs like the Ford Explorer or Dodge Durango,” Edmunds adds. The usual attention to comfort and quality make the 2008 Honda Pilot a contender five years running. The 2008 Honda Pilot set the standards in 2003 for the crossover class in terms of comfort, ergonomics, and fit and finish—and still holds up well five years later. When it comes to hauling cargo, the Pilot impresses reviewers from around the Web. Car and Driver says the Pilot has “an astonishing amount of utility within its moderate dimensions,” while Cars.com notes the “maximum cargo volume totals 87.6 cubic feet” and that “a 4-foot-wide sheet of plywood will fit flat on the floor.” Edmunds observes “with all seats occupied, there's still enough room for grocery bags, baby equipment or a set of golf clubs.“ Mother Proof grows giddy over the “tons of bins and pockets for containing and hiding all our stuff” and “amazingly flexible” center console. The Pilot’s assembly quality goes unquestioned, but some interior plastics and shapes look their age. 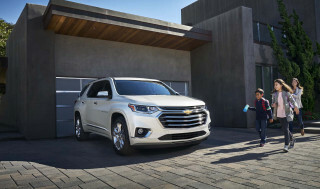 “The cabin features good ergonomics, straightforward controls and high-quality materials,” Edmunds reports, and Kelley Blue Book likes the interior and says "the optional perforated leather seats...are all wrapped in quality materials." Like other reviews, it proclaims "the Pilot's overall fit and finish is flawless," which helps to explain the Honda Pilot's good residual and resale values. ConsumerGuide Auto feels there is "an abundance of hard plastic trim," though, and dislikes the transmission shifter's placement on the column and that "its imprecise action means it often overshoots the Drive position." Yet they feel "fit/finish are up to Honda's usual standards." Cars.com remarks "though respectable, the [interior] materials aren't as rich as those of some fresher competitors." The stars have it: The 2008 Honda Pilot is among the safest vehicles on the road. The 2008 Honda Pilot is one of the safest eight-passenger crossover vehicles on the market. The National Highway Traffic Safety Administration (NHTSA) rates the 2008 Honda Pilot at five stars for all crash tests it performs, front and side included. A four-star rollover rating is awarded to the Pilot as well, and the Insurance Institute for Highway Safety (IIHS) concurs by giving the Pilot its Top Safety Pick. 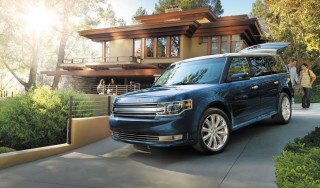 Cars.com notes the Pilot comes standard with traction control, ABS with disc brakes on all four wheels, electronic stability control, curtain airbags for all three rows, and side airbags for front passengers. It also offers four-wheel drive. Each of the 2008 Pilot’s eight seating positions has a headrest, for protection in accidents where whiplash can occur. The 2008 Honda Pilot has features that please families, but the navigation and DVD entertainment systems exclude each other—and there’s no MP3 input. The base 2008 Honda Pilot has enough standard features to satisfy most; more expensive versions load up on all kinds of electronic extravagances. The Pilot is available in four trim levels: VP, SE, EX, and EX-L. Standard equipment includes, but is not limited to: power windows and locks, manual front and rear air conditioning, remote keyless entry, machined alloy wheels, XM Satellite Radio, six-disc in-dash CD player, tilt steering wheel with audio controls, and cruise control. Edmunds notes that stepping up to the EX brings a power-adjustable driver's seat, auto climate control, and HomeLink but not satellite radio. The SE slots between the EX and EX-L, and it's equipped with cloth seats, a sunroof, satellite radio, the DVD entertainment system, and a 115-volt power outlet on the front console. The EX-L adds leather, a sunroof, satellite radio, heated front seats, and either navigation or a DVD entertainment system, "but you can't get both." Mother Proof also mentions there’s no auxiliary jack for an iPod. ConsumerGuide has mixed feelings about the navigation system, which "is easier to learn and use than most, but its screen is small and the driver must stretch to reach the main toggle control." 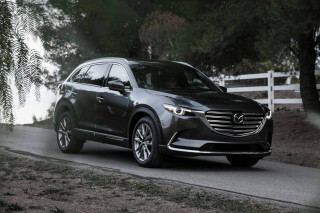 Some reviews read by TheCarConnection.com are not fond of the tailgate, which lacks an opening glass partition, and the seat warmers that may not be powerful enough for everyone.